It all started back in 1985 when drummer Kevin Kuzma and bassist Louis Starita joined forces with vocalist Gary Markovitch and guitarist Adam Tranquilli under the name, BLOOD LUST. 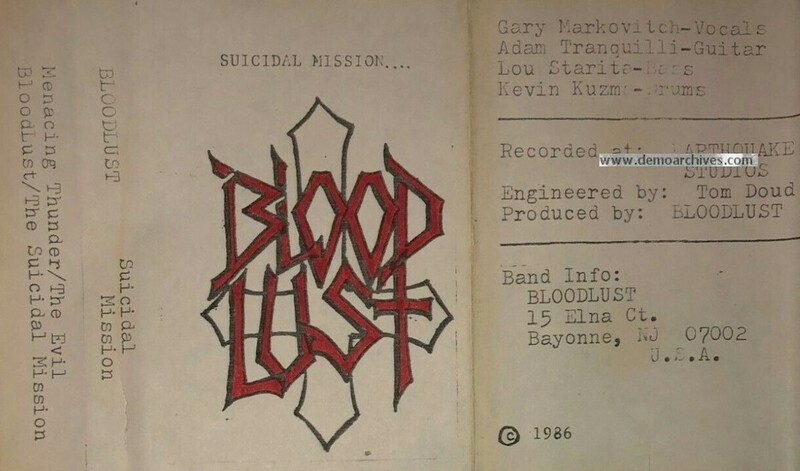 BLOOD LUST's maiden studio effort surfaced in February of 1986 in the form of a four song demo tape entitled The Suicidal Missions. Later that month, the talents of Michael Basden were recruited for the band as a second guitar player. In May of 1986 the band was approached by New Renaissance Records to appear on a pair of compilation albums, Thrash Metal Attack and Speed Metal Hell Volume 3, with two tracks lifted straight off the demo tape. Another band in CA released a album under the name of Blood Lust and it forced the NJ Bloodfeast to label their music as NJBL (New Jersey Blood Lust). This didnt work as soon afterwards the band was forced to change their name, and so they did... now calling themselves BLOOD FEAST. In June of 1986, New Renaissance Records offered the band an album contract.